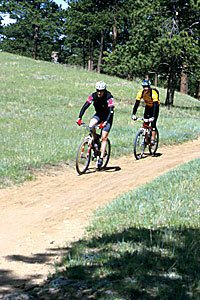 Betasso Preserve is a 773 acre preserve overseen by Boulder Country Parks and Open Space. For the best ride head west from the trailhead and after a short climb you will begin a winding descent along some doubletrack. The double track section quickly intersects some single track, which winds even further down through grassy meadows, into a Douglas Fir and Ponderosa Pine forest. A portion of this section was completely reconstructed in 1999 to let eroded areas on the previous trail recover. After you have descended into the thicker forests, the trail traverses along a hillside, crosses a creek and begins to loop around and climb back out towards the trailhead. Once back at the main trailhead, you can take a breather at one of the picnic tables, or use the public facilities. If you feel like catching a little more technical riding you can head out the park entrance and turn left toward the water treatment facility. A few hundred feet down the road is the Bummer's Rock trailhead. Instead of going up the trail, go left down it and you will encounter a tricky descent that will lead you Boulder Canyon road, just below the first tunnel.